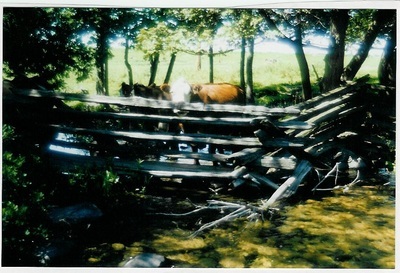 Site M-63 had extensive erosion had occurred over the past century due to previous poor land use practices and log drives. In order to rehabilitate this site, bio-engineered site design methods concentrated on restoring the proper bank full width, which in turn accomplished two goals of the strategy in reducing river width and increasing river depth. A large excavator mounted hydraulic rock hammer created pools in the soft limestone to narrow overall width and thereby increasing the rivers depth and provide in stream cover. 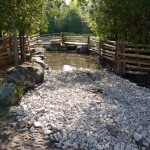 Large boulders were strategically placed to positively utilize water flows and to create more in-stream aquatic habitat. 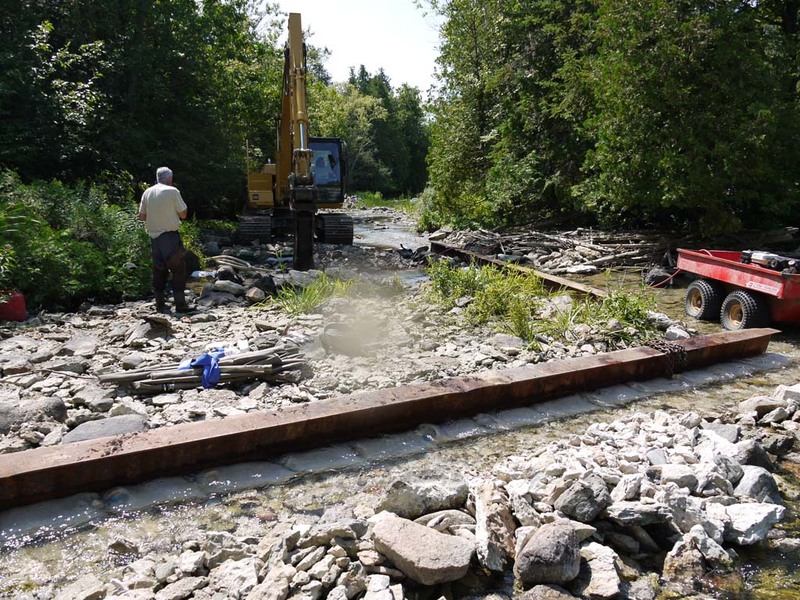 This site had a total of 157 in-stream structures created including (21 boulders installed around the watering pad, 3 excavated pools in the limestone bedrock for a total of 50.22m3coverage, 3 spawning beds with a total of 16.74m3 coverage, 10 random boulders (approx 1m diameter), 2 vortex weirs made of 37 boulders (approx. 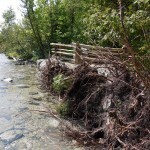 1m diameter), 55 boulders stabilizing the shoreline, 6 root wads stabilizing the shoreline, broken rock from the pools used to stabilize 43.m3 of the shoreline, 2 single wing deflectors (32.5m3), 6,300m2 of aquatic eco-system created/restored, and a 60m2 watering pad for livestock. Volunteer efforts included installation of 152m of cedar rail fencing to restrict cattle from entering the Manitou River. 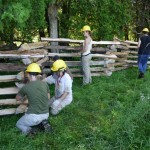 The MNR Manitoulin Stewardship Rangers began work on August 13, 2009 and worked until August 14, 2009. Their group consisted of 1 Stewardship Ranger leader and 4 Stewardship Rangers. They contributed 70 hrs of labour, 2 vehicle days and traveled 311.7km. 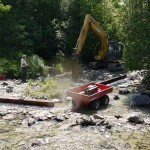 The Killarney Ontario Rangers came and participated in the Norton’s Creek project with 24 rangers and 4 leaders. They contributed 140 hrs of labour, had 2 vehicle days and traveled 326.4km. 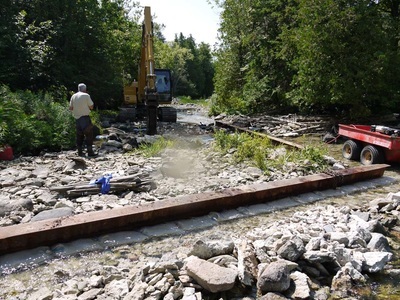 This project had 7 volunteers from the Board of Directors of Manitoulin Streams, 2co-workers. “Manitoulin Streams” Board members (8 meetings, 125 people attending, 159 hrs) attended meetings to discuss planning procedures. The landowner contributed 48 hrs of labour and 5 hrs of attending meetings and the in-kind support included supplying materials (nails, wire, boulders), use of tractor and chainsaw. Funding contributions toward the construction of the project include CFWIP, COA and NOHFC.